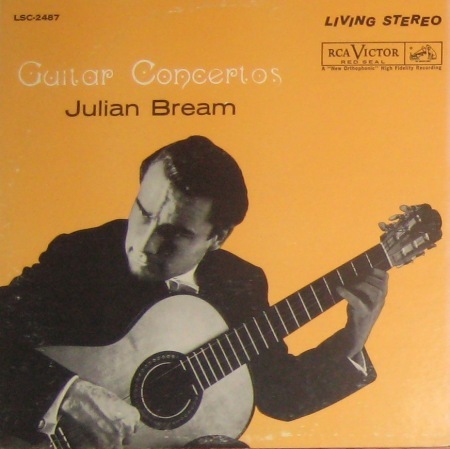 When I was a young lad, we stopped by a garage sale in Cannon Beach, Oregon, on a family vacation and I encountered a record of Julian Bream playing this 1959 piece along with the concerto by the baroque composer Albinoni, which is also very good. My mother was deeply skeptical of my request for the 50 cents needed to buy it, having not yet woken up to the reality that her son was a genuine classical music enthusiast. The Arnold piece is a good antidote for anyone convinced that nothing written in the middle of the 20th Century is listenable. This attitude is as regrettable because it is untrue; the truth of the matter is that there is merely very little that was written in the middle of the 20th Century that is listenable. The Arnold Concerto is quite listenable; it starts out with some of what are generally called “angular dissonances” in the full orchestra, but they aren’t too too dissonant nor too too, um, “angular,” and the guitar presses things forward with an energy that is downright jaunty. Then, about a minute and a half in, a theme of surprising delicacy and sweetness pops out. It’s a lyrical little line that could be the melody of a lovely popular song – the guitarist plays it first, but eventually the strings will take a whack at it too. The upbeat, energetic tone sticks around for the rest of the piece, sometimes bopping along at a good clip and sometimes pausing for reflective moments. There are damn few pieces for guitar and orchestra, which means that guitarists who want to play with an orchestra, or orchestras who want to perform with a guitarist, have only a handful of obvious choices. This makes the Arnold Concerto (or the Albinoni, too) reasonably easy to find; it makes the list fairly often whenever anybody decides to put together an orchestra-and-guitar album. Here’s a link to the first movement for ya: http://www.youtube.com/watch?v=m8-V3OqgeUI. Hmm. So much for "You've Never Heard Of..."